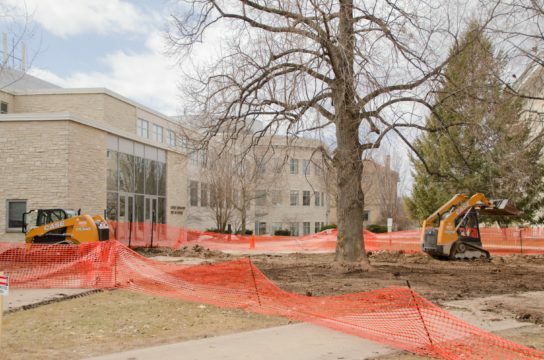 Lawrence University is currently undergoing construction on the west side of campus, completely blocking access to a strip of land spamning from Youngchild Hall to the sidewalk of College Ave. This construction is being done on a steam line that provided heating for four buildings on campus: The Seeley G. Mudd Library, Memorial Chapel, Shattuck Hall and the Music-Drama Center. As of April 3, construction is still underway in front of Youngchild Hall, spreading all the way to College Avenue. The break caused these buildings to be without heat for several days until the damage could be repaired. Problems were first noticed on Friday, Mar. 15, at which time excavation began. At first, the extent of the problem was not known, and excavation was required simply to identify the damage. Four days later, it was deemed necessary to replace the entire line. Heat was lost to the four affected buildings, but it was returned before classes resumed on Monday, Mar. 24. The ramifications for the steam line break seem to be minimal. The majority of students were gone for spring break and the buildings without central heating never dropped below acceptable temperatures, allowing staff to continue operation. The main question that is now circulating is, “What about the construction?” While the line break itself may not have caused too much of a headache for the average student, the construction is an inconvenience for most of campus. As of now, there is no easy way to access the western academic or dorm buildings from the eastern side of campus. This forces students, when traversing from one side of campus to another, to either cut behind Thomas A. Steitz Hall and Youngchild, or make the trek all the way up to the sidewalk on College Ave. While not an enormous inconvenience, it does add to commute times between classes. Steam line construction has blocked the pathways on Main Hall Green for the first two weeks of Spring Term. The last update students received was on March 22, stating that the temperature within affected buildings may continue to fluctuate, but including no detail on when construction will be completed. Additionally, the cause of the break was not specified in the emails, and whether any other parts of campus might have similar problems in the future is not known. If this does happen in the future—perhaps at a less convenient time—are there any safeguards in place to ensure the school will continue to function normally? The Lawrentian has reached out to Facility Services to ask these questions, but at this time there has been no response. In the meantime, we will have to continue to deal with the construction. This is not the first time construction has inconvenienced students, nor will it be the last. This same time last year, large parts of the walkways outside of the library were replaced. 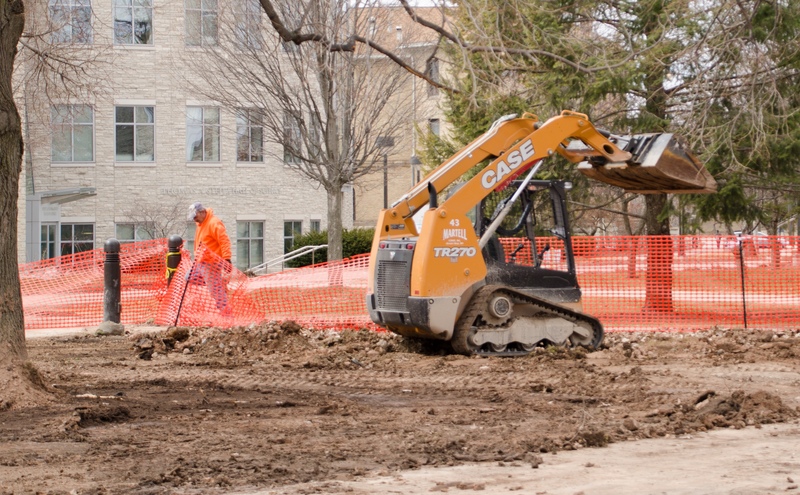 According to the email, the area is unsafe due to the amount of digging, and until the sidewalks reopen, students must continue to circumvent the construction. If the Lawrentian staff hears from Facility Services, it will be reported as soon as possible; until then, keep an eye out for any emails relating to the construction and when we can expect campus to fully reopen.